In the middle of a field a little off the north side of the Rothbury-Alnwick B6341 road – at roughly the half-way point between the two towns – stands a curious collection of monuments which is likely to leave the casual passer-by well and truly befuddled. The centrepiece is an 80ft column crowned by what is essentially a second, truncated column. Around and about there stand a scattering of what at first appear to be gravestones. 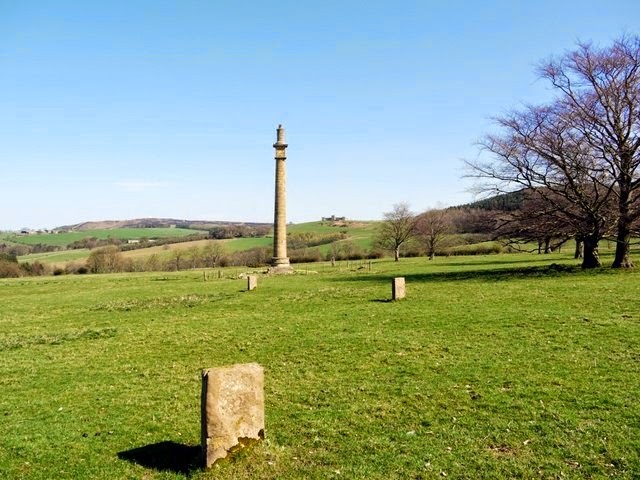 The column was originally erected in the village of Felbridge on the Sussex-Surrey border, and was the brainchild of James Evelyn as a tribute to the memory of his parents, Edward and Julie Evelyn. It was designed by Sir John Soane and unveiled in 1785 – its simple lines and features signifying ‘birth’, ‘life’ and ‘eternity’, apparently. It has an inscription near its base bearing verses from Addison’s Hymn of Gratitude. It came to Northumberland after the family’s Felbridge estate was sold in 1927 – the item being moved lock, stock and barrel to its present location (the grounds of Lemmington Hall) by new owner, Sir Stephen Harry Aitchison. It was transported with some difficulty (and not a little expense) by sea, road and a specially constructed railway – for no other reason, I suppose, than that he could afford to do it … so why not? The three gravestone-like slabs nearby commemorate the births of three children of Sir Stephen’s successor, Sir Walter Aitchison, in 1923, 1925 and 1927. Nearby is another standing stone bearing the words “I will lift up mine eyes unto the hills”.